I found a couple of graphic 45 Botanical Tea cards that I haven’t posted yet, and nathan and I haven’t done any photo-ing since we have been back from holidays, time just runs away just now, so I thought I would show these in the mean time, until we find a morning to get the camera out. 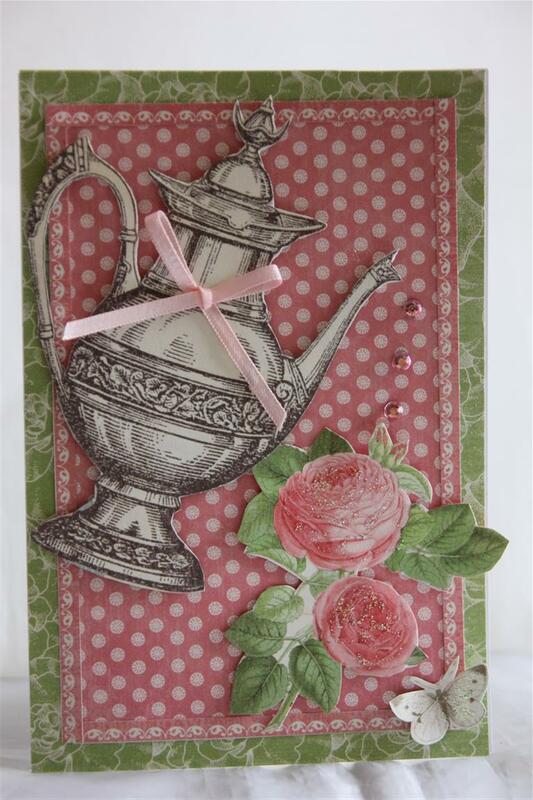 I have layered two pieces of the patterned paper,and used some very slim strips to act as a frame, fussy cut the tea pot and flowers,and butterfly and added a ribbon bow ( as I tend to do!) and some kindyglitz and rhinestones to finish. 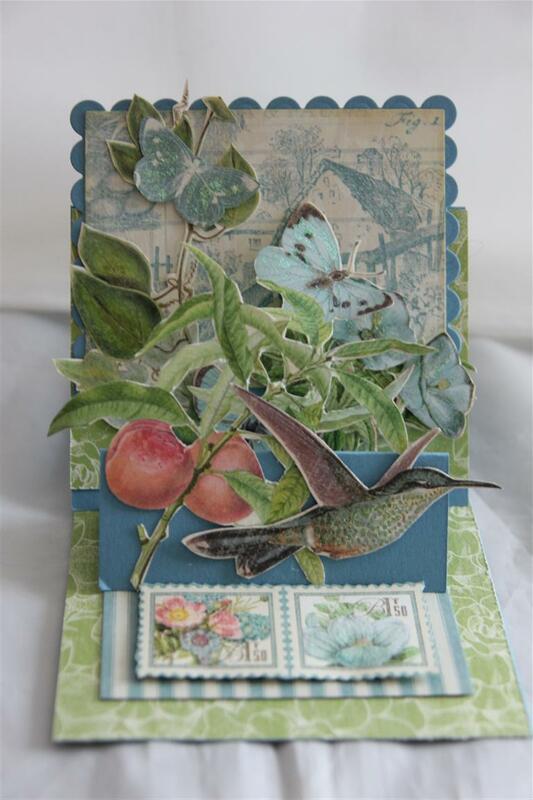 I have lots of papers I havent created with yet so I am hoping to get into the craft room this weekend if it’s not too cold – it’s a miserable day here today, so it’s not looking good for the weekend! Til tomorrow…. Another Botanical Tea tonight – lots of fussy cutting, and some lace and ribbon. i do all my fussy cutting in the ebenings when I am watching TV, so when it comes to putting the cards together it’s all done, so these cards come together very quickly, and they are my favourite kind of card to make!still pushed for time, but I see light at the end of the tunnel – one more day, then holidays! til tomorrow…. really quick post tonight, and I may be a bit erratic over the next few days as I am doing a huge amount of hours at work this week for stocktake. We are back to Graphic 45 Botanical tea today, and its just the paper, no further embellishing, and all edges inked in tea dye ink. til tomorrow….. Here is the last of my Graphic 45 Botanical Tea ( for now) . For this last one I edged all my pieces with Tea Dye distress ink, did some fussy cutting, and used some yellow liquid pearls and kindyglitz to finish.Some of the flowers were 3″d with foam pads.I have spent this afternoon in the craft room planning out one of my June lessons. A different kind of lesson for that month – it will be interesting to see what the ladies think of it. 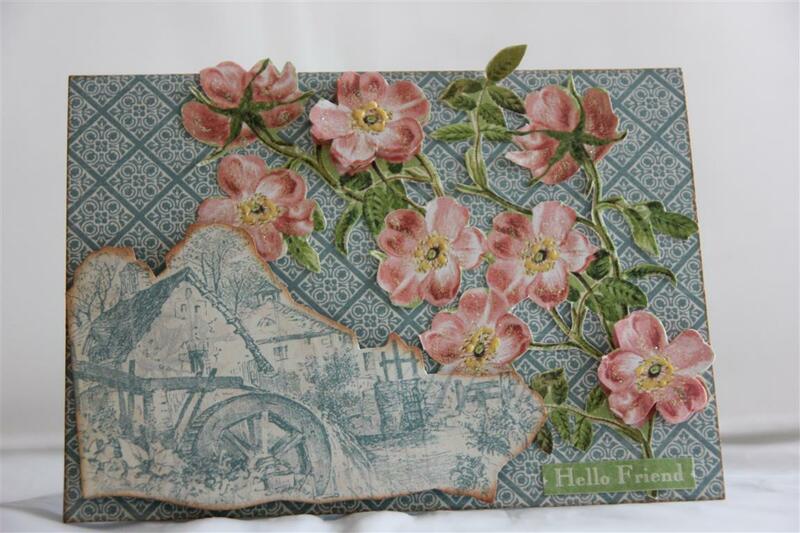 I have had great fun playing with a couple of new dies from couture creations. 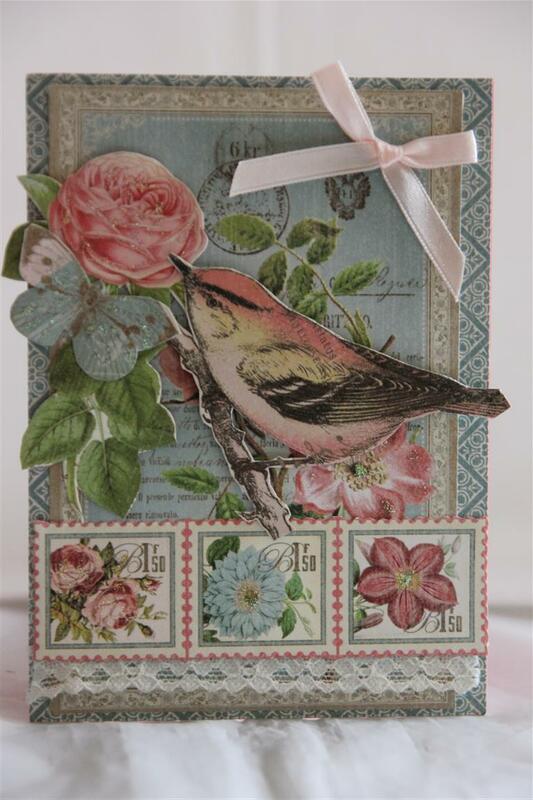 I am heading back there in a minute to do some stamping – haven’t done much of that lately, and I am feeling creative! til tomorrow…. Quickest of posts tonight as I am running som far behind with tea! 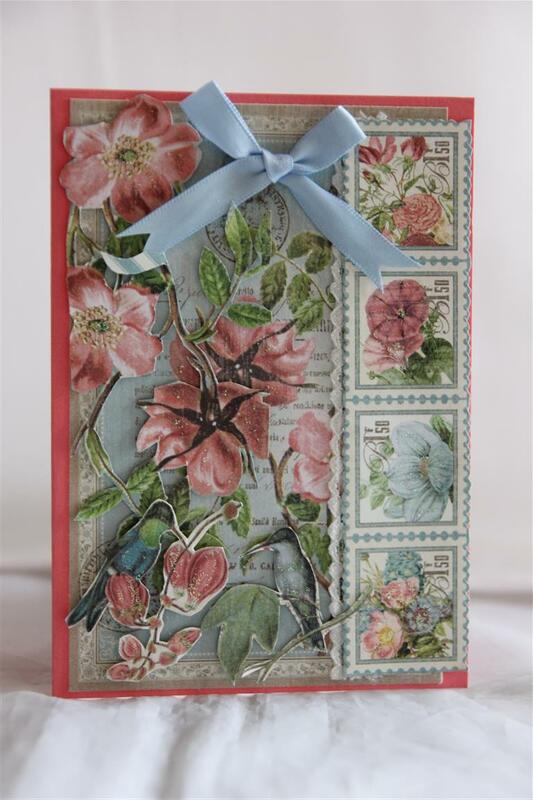 Graphic 45 Botanical Tea paper collection, a bit of layering and lots of fussy cutting! Lace and ribbon bow to finish it off! Til tomorrow…. 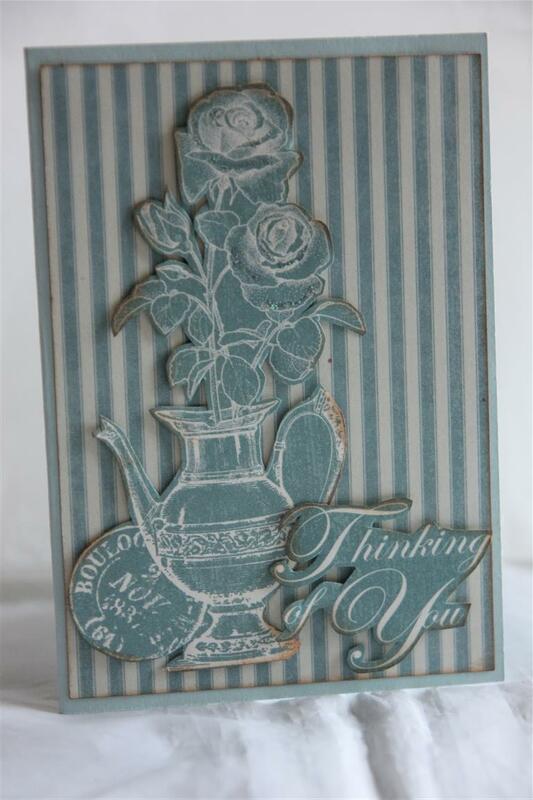 Lots of fussy fussy cutting on this one! 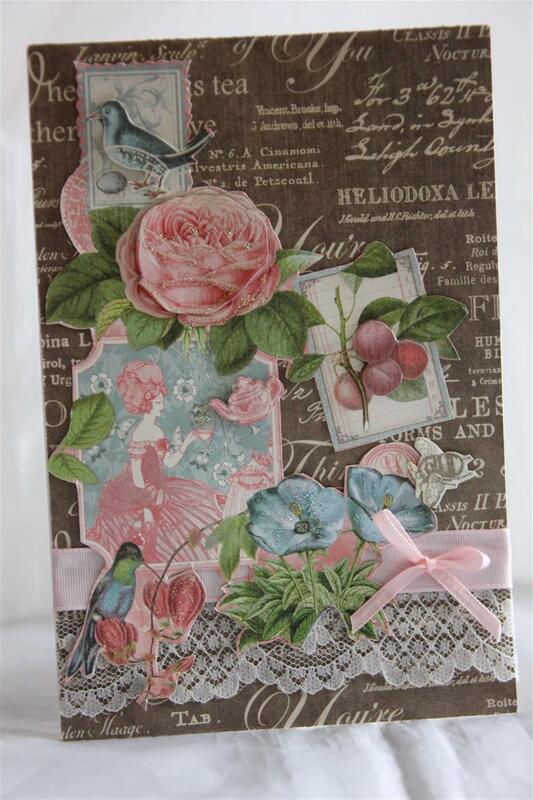 Graphic 45 Botanical Tea paper collection, ribbon , lace and kindyglitz. the cardstock is by stampin up.Today I picked up my graphic 45 by the sea paper so tonight i look forward to watching some tv and fussy cutting so that I can start creating with it. I also picked up the rest of my lesson requirements for June lessons, so I am all sorted for a creative Eatser! Til tomorrow…..